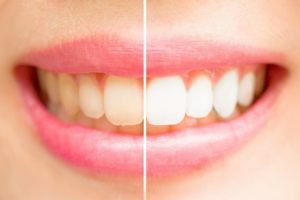 Over the years, you may have heard of at-home teeth whitening fads that claim they can whiten teeth just as well or even better than professionally done treatments. Everything from charcoal to fruit and baking soda has been touted as a full-proof alternative even with no evidence to back it up. Your cosmetic dentist in Massapequa wants to help you avoid unnecessary damage to your teeth. To do that, here’s a few fads to avoid at all costs. This is considered one of the more common “methods” due to the simple ingredients used. The idea is to take an acidic fruit and create a mash out of it and then mix it baking soda. The assumption is when the two are mixed together and brushed onto your teeth, it creates a fizzy paste that lifts stains out of your enamel. However, because the baking soda fails to fully neutralize the acidity of the fruit, you end up brushing your teeth with an acid so abrasive it causes your enamel to wear down rather than only removing stains. This is why using at-home chemicals can be so dangerous for your teeth. While hydrogen peroxide can be found in teeth-whitening products pre-approved by the ADA, it doesn’t mean it that using it on its own won’t cause unintended side effects to your teeth. Whether it be over-the-counter or dentist-provided varieties, the concentration of hydrogen peroxide is much lower in comparison to what you’ll find in a bottle in your medicine cabinet. Swishing hydrogen peroxide in your mouth to whiten teeth can actually cause moderate to severe tooth sensitivity, so don’t attempt this unless you want to make eating and drinking more difficult. Oil pulling specifically refers to taking raw coconut oil and swishing it around your mouth like mouthwash to lift stains. Unfortunately, there’s currently no evidence that this method lifts stains from your teeth and as a result the ADA does not recommend it as a teeth-whitening treatment. Don’t replace your fluoridated mouthwash with a substance that may not hold any benefit whatsoever. Additionally, coconut oil is one of the more expensive oils out there, so you’ll only be wasting your time and your money. Ah yes, charcoal whitening has been making its rounds on the Internet this past year. Regardless of the amount of attention it gets, there is no evidence that it can whiten teeth as well as ADA-approved whitening treatments. In fact, similar to the fruit and baking soda myth, charcoal whitening products may actually be too abrasive for your teeth and wear down your tooth’s enamel. Damaging your enamel is not worth it to remove the stains on your teeth. Proper teeth-whitening treatments are designed to pass through the enamel and reach the dentin, not remove the enamel entirely. Don’t be fooled by harmful teeth-whitening treatments. Contact your dentist about legitimate teeth-whitening in Massapequa today! Dr. Dory Stutman earned his dental degree from the School of Graduate Dentistry at Case Western Reserve University. He went on to complete his general practice residency at MetroHealth Medical Center in Cleveland, OH and complete a postgraduate program in esthetic dentistry at the University of Buffalo. To learn more his practice and teeth-whitening treatments, contact him at (516) 798-3803 or visit his website. by: Dr. Stutman's Office at January 5, 2018 .